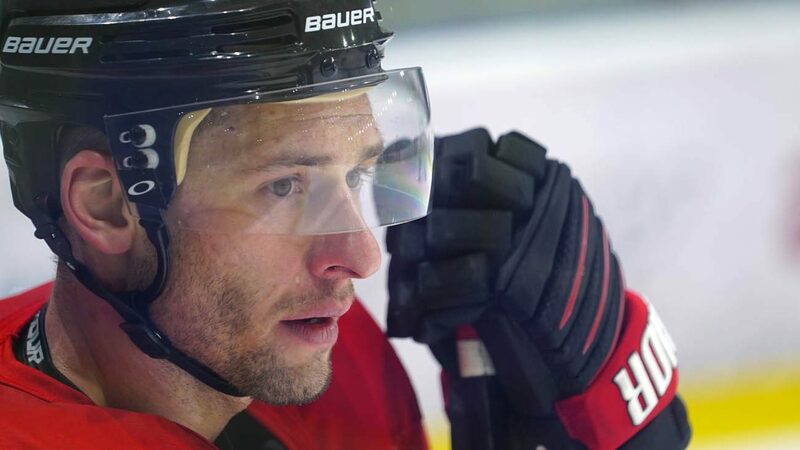 TORONTO (CNS) — Wojtek Wolski has gone from being a can’t-miss prospect from St. Michael’s College to a disillusioned young man who wanted to quit hockey, to a hospital patient facing a long comeback after shattering injury, and now to a man who has a shot at Olympic glory. Every stage has been a physical and emotional trial for the 31-year-old left wing from Etobicoke, Ontario, and he credits his hard-working parents, Zofia and Wes, as well as his Catholic faith for his perseverance. “The only time you really fail at something is when you quit,” said Wolski, who joins Team Canada in its gold-medal quest starting Feb. 15 against Switzerland in Pyeongchang, South Korea. Wolski likes to read about successful people and what makes them tick. He reads a little every evening. Then, he says his prayers before bed and enters dreamland. Sixteen months ago, however, he went through a real-life nightmare. He broke his neck in two places and suffered a concussion in the 19th game of his season in Russia. Wolski had played for five different NHL teams in three years after being traded four times — from the Colorado Avalanche to the Arizona Coyotes to the New York Rangers to the Florida Panthers — and signing with the Washington Capitals for his final stop in the league. “I had scored 23 goals (in 2009-10) in a season split between Colorado and the Coyotes,” Wolski said. “I was excited. It was my best season. But the next year I started to suffer from groin problems and a bad back. “I was engaged, but that fell apart, too. When I bounced around with all the trades, I wanted to quit. I was depressed. I started seeing a psychiatrist. Wolski rediscovered his love for the game in Russia. He signed a two-year contract to play for Torpedo Nizhny Novgorod of the Kontinental Hockey League in 2013. He thought it would be his last contract in hockey. But he found his game again. He played so well, one of the better teams in Russia, Metallurg Magnitogorsk, lured Wolski away, and he helped the team win the 2015-16 Gagarin Cup. “Somehow, I started playing well, liking the game again,” said Wolski. He started a family while playing in Russia and now has two children, 2-year-old Weston and 11-month-old Lennon, with his Canadian wife, Jesse. “I think it was because I had so much alone time in Russia that I started to work on myself as a person on my own, and it just seemed to agree with me. I found happiness,” he said. Wolski used to follow his brother to an outdoor rink in their Toronto neighborhood, but got fed up having to wear Kordian’s hand-me-down skates. So, with money received for his first Communion, he went to a second-hand sporting goods store to buy a pair of used skates. “Those skates are still hanging on a wall in my parent’s house,” Wolski said. He developed quickly and played junior B level hockey at St. Michael’s College in Toronto. “We had a 15-minute Mass at lunchtime at St. Mike’s,” he said. “On game days, I would go with a teammate and say a prayer. In Russia, in the fall of 2016, life was good for Wolski, on and off the ice. But on Oct. 16, a “bizarre” turn of events threatened it all. His team was on the power play in the third period. Wolski slid to poke the puck back to his teammate Chris Lee, who is also part of Canada’s Olympic team. “It was such a bizarre play because he was going sideways,” Lee recalled. “An opponent fell on him and they slid into the boards,” Lee said. Wolski remembers everything about that incident. 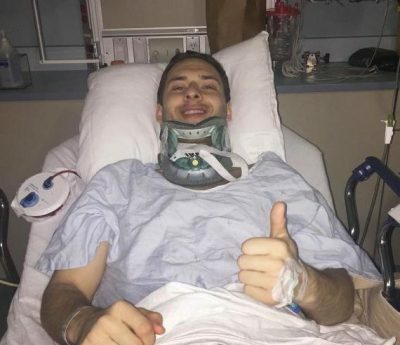 He remembers thinking he had been paralyzed, but then after “30 to 40 seconds” being able to move his arms and legs. He remembers joking with the trainer in the ambulance ride to the hospital. He remembers not being strapped in properly and feeling every bump along the way, especially driving over train tracks. Wolski’s season was over. With the help of Toronto-based trainer Matt Nichol, Wolski worked himself back into shape and earned a spot on the Canadian Olympic roster. “Wojtek is a great person,” said Mike Pelino, Metallurg Magnitogorsk assistant coach. “He’s really deserving of representing Canada, and he will make the Canadian fans proud with his efforts and with the passion he plays with. “I am very happy for him to have earned this opportunity, and more so to have been able to come back after such a horrific incident,” he said. “I must admit I had a real sick feeling in my stomach because you knew that it was something serious. Wolski says perseverance is the key for Team Canada. “We’re a bunch of guys who never gave up. We’ve all found a way to keep our careers going, because we haven’t given up on ourselves,” he said. Wharnsby is a writer in Toronto, contributing to the Catholic Register.